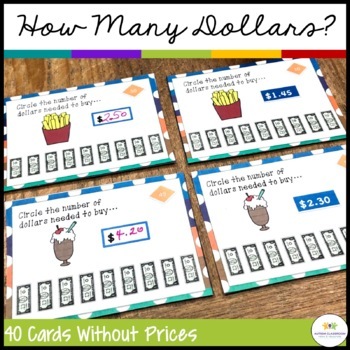 I developed these task cards as a functional curriculum teacher resource for middle and high school students in special education who are working on understanding money. The set would work well with younger students as well as part of either the core curriculum or to meet IEP goals. *****NOW AVAILABLE AS PART OF THREE BUNDLES OF RESOURCES AT A REDUCED RATE! 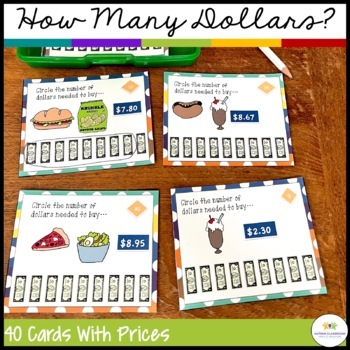 There are 2 sets included.The sets are identical except one has prices and one has a place for the teacher to write the price in so it can be changed. In both sets the student circles the number of bills required to buy an item with a price tag on the card. One set (1-40) has prices set on it. The second set (41-80) are the same cards with empty price tags that the teacher can complete. This set is useful if you have students who tend to memorize answers. You can change the prices on the items regularly so the students cannot memorize them. The cards have restaurant and grocery items with prices between $1 and $9. The answer key is included. Because the student answers by circling the dollar bills needed on card, I did not include an answer sheet. However, if you would like one, email me at drchrisreeve@gmail.com and I’m happy to make one and send it to you. As a group you can put them on a document camera and have the students use dry erase boards (or laminated sheet of paper) to select their answers, write them down and show them as response cards. The teacher can then check the work of all the students to see who has the right answer and who does not. 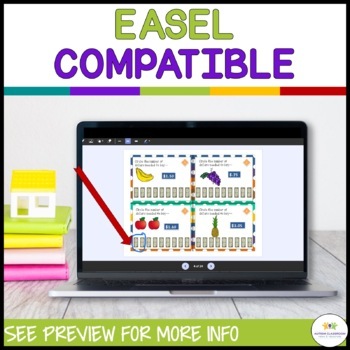 You can choose the task cards you want the students to complete based on their level of difficulty and give them a set to complete during small group or independent work. You can include them in a student’s structured work system and can mix them up across the sessions so the students are always completing a different set of cards. For more ideas and uses of the cards, please see my blog at Autism Classroom News. I will be making more of these types of resources for older students. To keep up with new products, follow me at TPT or like my Facebook Page. Also, don’t forget to leave feedback! Thanks for your interest in the product. 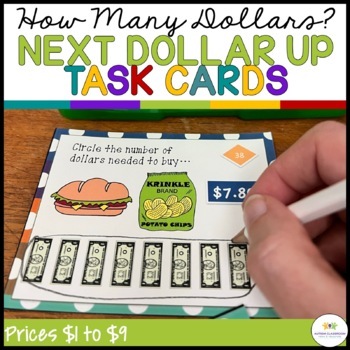 Next Dollar Up Task Cards: Money Skills (Special Education) by Christine Reeve is licensed under a Creative Commons Attribution-NonCommercial-NoDerivs 3.0 Unported License.